The Red Guard patrol near Smolny, Petrograd, 1917. Conspiracy theories about the causes of the Russian Revolution emerged at virtually the same time that the Bolsheviks took power and have been discussed for the past century. Who caused the country's venerable monarchy to crumble so quickly: Freemasons, the British or the Germans? The monarchy ended in Russia in February 1917. Immediately, rumors began circulating that this had happened at the instigation of the country’s Triple Entente allies, primarily Britain. Such assertions remain popular to this day. In his book 1917: Not a Revolution but a Special Operation, the Russian writer and columnist Nikolai Starikov claims that the Russian Revolution was the result of a British ploy aimed at weakening the Russian Empire. A more mainstream conspiracy theory is that the British were motivated to overthrow the Russian royal dynasty in order to eliminate the tsar and especially the tsarina, who allegedly harbored sympathies for Germany. Dethroning this unpopular monarch, the reasoning goes, would protect Russia from massive revolutionary upheaval and prevent subsequent Russian withdrawal from World War I. The British ambassador to Russia, George Buchanan, was believed to be the ringleader of the conspirators at the time. Anna Vyrubova, Tsarina Alexandra Fyodorovna’s best friend and a lady-in-waiting of the Russian Imperial Court, wrote in her memoirs: “His Majesty told me that he had on good authority that Sir Buchanan, the British ambassador, was taking an active part in plots against Their Majesties and even hosting meetings with grand dukes on this topic at the embassy.” These suspicions irritated Buchanan, who would later categorically deny in his memoirs that he had anything to do with revolutionary activity in Russia. Historians have not offered any evidence of Buchanan's involvement in the conspiracy, if there ever was one, it is possible that Britain played a role in the Russian Revolution. One theory is that British intelligence services may have been involved in the assassination of Alexandra Fyodorovna's minion Grigori Rasputin. London considered Rasputin a vehicle for German influence, if not a downright German spy. Andrey Ivanov, a historian from St. Petersburg, believes that it has been “proven beyond a doubt that there was participation [in Rasputin's assassination] by representatives of the British diplomatic mission in St. Petersburg and persons associated with British intelligence services.” Numerous public figures at the time, including Chairman of Parliament Mikhail Rodzianko, believed that Rasputin's death triggered the revolution. The theory of a Masonic conspiracy is just as popular. Freemasons played a prominent role in Russian political life during the early 20th Century. People who became the subjects of rumors regarding a potential 1917 Masonic conspiracy to topple the emperor found they had to justify themselves. In his memoirs, Alexander Kerensky, one of the key players in the events of 1917, dismissed statements to the effect that “the fall of the monarchy and the establishment of the Provisional Government [had anything to do] with the Lodges.” Kerensky claimed such allegations were absurd. Nevertheless, while there may not have been a Masonic conspiracy, the political role that Freemasons played in revolutionary events cannot be denied. In Russia, the Freemasonry movement had a mission to assist in the country's progressive development, including political reform, and included many influential opposition members of parliament. Both liberal politicians and Social Democrats belonged to the Lodge. Nikolay Chkheidze, a Freemason, was a member of parliament prior to the revolution and in 1917 became the first chairman of the Petrograd Soviet of Workers and Soldiers' Deputies. This institution laid the foundation for the Soviet regime. Whatever the case may be, the Lodge failed to protect the provisional government from mass popular protests even after Kerensky became the prime minister in July 1917. “The political organization, which had been an instrument of opposition to tsarism, no longer mattered after the overthrow of the emperor,” writes historian Oleg Solovyov. According to yet another popular conspiracy theory, the 1917 Revolution was staged by the Bolsheviks with the aid of German money. These rumors are based on the fact that in April 1917, Bolshevik leader Vladimir Lenin and his associates traveled to Petrograd by rail via Germany, which Russia was at war with at the time. Following the failed attempt of the Bolsheviks to seize power in Petrograd that June, the provisional government accused them of having ties to Germany. The Ministry of Justice suspected Lenin of committing high treason and having been recruited by German intelligence services. Lenin in disguise-clean-shaven, with a wig on. Dmitry Leshchenko made this photograph on July 29 (August 11, New Style), 1917, in Razliv on Bolshevik Party Central Committee order for a forged identity card on which the Bolshevik leader fled to Finland under the name of Ivanov, Sestroretsk Arms Works employee. / Photo: Mary Evans/Global Look PressThese accusations of spying eventually faded and were replaced with allegations that Germany had generously funded the Bolsheviks in an attempt to force Russia to pull out of the war. A number of Western historians wrote that the Bolsheviks had been paid tens of millions in German marks. In the late 1980s, some Russian historians began to espouse this theory as well. Nevertheless, as one Russian historian writes, “No irrefutable evidence has been found to confirm that [the Bolsheviks] were paid by Germany to stage a revolution.” The authoritative St. Petersburg researcher Gennady Sobolev believes this theory merits further investigation. He notes, however, that, even if Berlin did fund the Bolsheviks, this is not what caused the revolution. 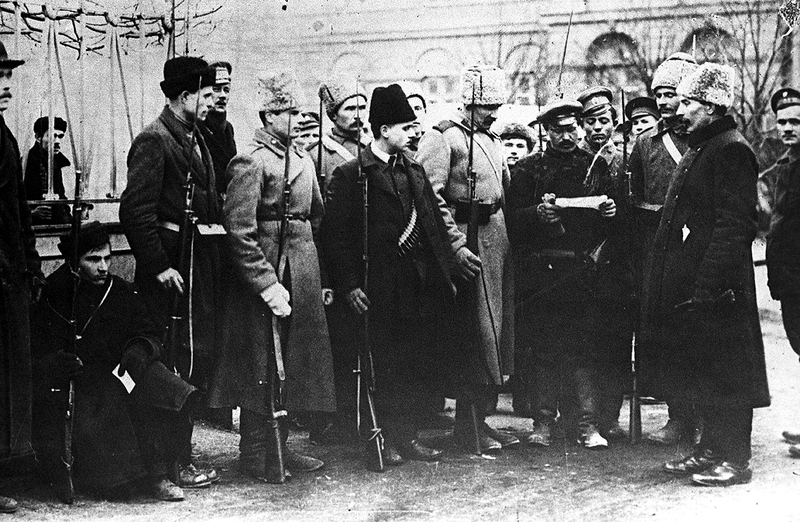 The Russian Revolution was caused by “deep internal factors exacerbated by World War I,” Sobolev points out.